The Health Ministry has admitted that they have a problem: they have not been able to maintain an adequate supply of drugs to our hospitals. As a result, patients have had to postpone or even forgo medication. And doctors have been forced to direct their patients to private pharmacies, which, many times, have also been frustratingly out of drugs. Worse still, the Health Ministry has admitted that they still do not know how to resolve the drug shortage issue, a problem that has reached chronic proportions during the past year. So they’ve announced that, as an interim measure, they will send officials to buy drugs directly from manufacturers in Bangladesh. I suspect that the officials who’ll be going to Bangladesh will be mainly, if not entirely, ministry personnel, most of them from the Drugs, Vaccines and Equipment Division (DVED). If that is so, that could very well be the problem – a central agency unable to keep up with the growing and changing needs of referral hospitals in general, and the Jigme Dorji Wangchuck National Referral Hospital in particular. DVED is the Health Ministry’s central procurement agency. They buy, stock and distribute drugs and equipment to hospitals throughout the country. That’s a lot of work, work that just gets more complicated as more people use the health system. 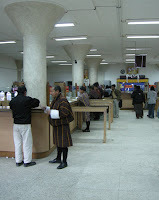 Between receiving orders for drugs from individual hospitals to supplying them with the drugs is a logistical nightmare that includes compiling and approving orders from the field; tendering and awarding procurement contracts; receiving, verifying and storing drugs; and finally, distributing them to every hospital and clinic, throughout the country. And all that must be done within the framework of the government’s tight financial rules and regulations. DVED’s centralized operations have served the nation’s health system faithfully till now. But the health system has changed drastically since the establishment of referral hospitals. And DVED would now find that procuring and delivering drugs to the new and growing referral hospitals is an increasingly difficult and complex matter, especially when their main task is still to service all the other hospitals throughout the country. So it’s time to decentralize procurement, at least for referral hospitals, and definitely for JDWNR hospital. And why would JDWNR hospital be able to do a better job? Incentives. When drugs run out, hospital staff take the flak. They are the ones who interact with patients every day, and the ones who, as far as patients are concerned, are at fault if hospital services are not adequate. So it is in the interest of hospital staff – nurses, doctors, technicians and administrators – to ensure that drugs, especially essential ones, are always available. Ministry officials, including DVED staff, cannot, and will not, share the same levels of concern. So decentralize drug procurement. Allow JDWNR hospital to acquire drugs without having to deal with the bureaucracy of the ministry. Otherwise, be prepared to face more serious drug shortages, more frequently. In fact, decentralize equipment procurement too. And all personnel matters, including training. And finance. And administration. Make the nation’s biggest and fastest growing hospital fully and truly autonomous. That way, hospital staff would feel a sense of control, a sense of ownership, a sense of purpose. And that would drive them to realize their full potential and to achieve their vision. But the Health Ministry must regulate them. And make them fully accountable. That way, services would improve, drug shortages would drop, and the health sector’s biggest disease – widespread corruption – would finally be contained for proper treatment. Consider this: Nu 38.32 billion had been budgeted for capital investments in the 9th Five Year Plan. Of that, Nu 9.32 billion had been budgeted for the dzongkhags and gewogs. That was about 24.37% of the total capital outlay. Now consider this: Nu 73.61 billion has been budgeted for capital investments in the 10th Five Year Plan. Of this, Nu 12 billion has been budgeted for the dzongkhags and gewogs. That is only 16.30% of the total capital outlay. In 2002, after two decades of decentralization, the government was prepared to earmark almost a quarter of the total capital outlay to Local Governments. Today, with democracy, the government should be giving proportionately more to Local Governments. In fact, at only 16.30% it’s preparing to give less. A lot less. We need to reconsider how resources are distributed. We need to seriously reconsider our priorities. Consider this: each minister would enjoy entitlements and benefits totaling about Nu 9,942,000 during the 10th Five Year Plan period. This is at current pay scales. (See my conservative estimates towards the end). Now consider this: 40 gewogs would each get capital funds amounting to less than Nu 9,942,000 each during the 10th Five Year Plan period. This is according to what has been budgeted in the draft 10th Five Year Plan. Three of them (Soe, Samrang and Khatoe) would not even get Nu 3 million each for the entire 10th Plan period – in other words, each of these gewogs would get less than one-third of what a minister would earn. Then consider this: each minister would enjoy entitlements and benefits totaling about Nu 13,842,000 during the 10th Five Year Plan period if the Pay Commission’s proposal is accepted. And consider this: 70 gewogs would get less than Nu 13,842,000 during the entire 10th Five Year Plan period. That means that 70 of the 205 gewogs would get less money each for capital works during the 10th Plan than what a minister would earn during the same period. True: Education, health and rural electrification are not included in the gewog budgets. And true, the dzongkahgs and central ministries would have additional programs that would benefit gewogs. Also true: people in the gewogs would be mainly concerned about money that they would have real control over. That is the funds that have been budgeted for their respective gewogs. And there may be 70 gewogs, each having access to less money than what one minister may earn.